When it comes to the living room, one of the most vital considerations for any interior remodeling project or overhaul comes down to the choice of lighting. Lighting is one of the most impactful design elements in any domestic interior. It has the power to create such a diverse range of moods and sensations, illuminating our interior spaces, enhancing their features and making them even more attractive, appealing and ambient than they would be otherwise. It's fair to say that without adequate and well curated lighting, your living spaces are only halfway there. 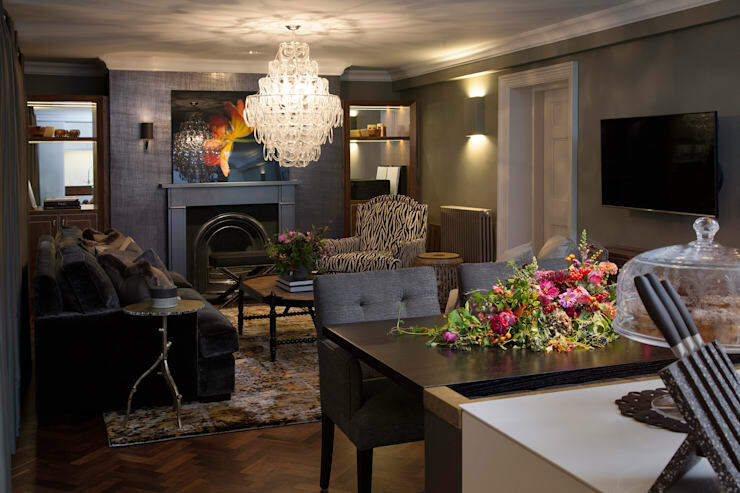 Today on homify, we're having a look at some of the more desirable and aesthetically pleasing ways you can incorporate lighting into your living room: from the type of bulb, to the style of fitting, the functionality of each particular piece and beyond. Take a walk through, get inspired, and take in a few bright ideas about how to make your living room space even more illuminated, desirable and alluring than ever before! Not all living rooms these days are set up around a TV set: in fact, many are switching off their modern distractions for more wholesome, family-friendly and quiet activities. While there's nothing wrong with a little television as such, a good living room really ought to double as the sort of space that you can lay back on a comfortable couch and enjoy a good book too—all under a perfect blend of interior lighting, of course. There are so many styles and types of lamps suited to maximising our relaxation in the living room, but it's a good idea to consider the varieties that will likely work the best for you. 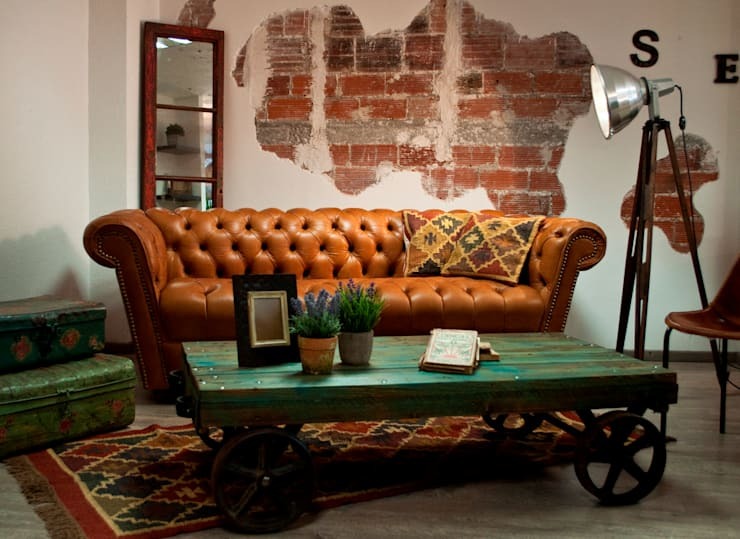 Here, we have a fabulously inviting living room space, replete with Chesterfield-style couch in a rustic, worn-brick and concrete floor setting, tied together with rustic coffee table and rug. It's a fine set up, but the real feature in this scene is the impressive feature floor lamp: brilliantly industrial, chrome finished, in keeping with the overall aesthetic of this cosy, inviting room. As well as looking fantastic, it spills a perfect quality of light over the couch space for a fantastic reading lamp. Selecting furnishings and accessories such as lamps can be a tricky thing when it comes to getting the balance right, whether it concerns your living spaces or any other space in the home. If you're in need of a little guidance or a few tips, why not chat to a professional to get you started? While the choice of lampshades remains an important consideration for the living space, selecting the type bulb and light source is perhaps an even more crucial element to consider. In recent years, we've seen an explosion in the array of interesting and unique lightbulb varieties on offer, from LED light bulbs, traditional-styled light globes, energy efficient bulbs and the infinitely variable (and very cool) Edison light globes. 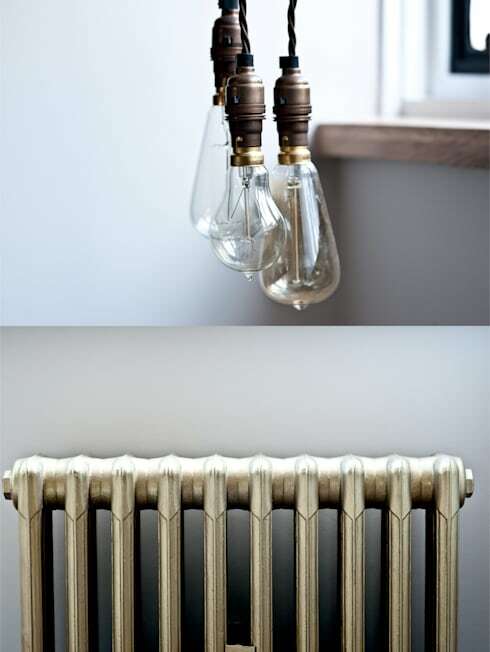 In fact, with so many stylish and creative bulbs on offer, many households these days are choosing to keep their bulbs bare without any additional lampshade obfuscation. In the right setting, a naked bulb, or set of bulbs, can give a decidedly modern, stripped back aesthetic, deploying ample, rich light throughout a living space while providing a neat design statement too. Side lamps are a neat addition to any living space, and are most commonly suited to low-sitting benches, coffee tables and side tables. Providing ample illumination without taking up too much space, side lamps are compact, relatively inexpensive and can make all the difference to the ambience of a living room interior. The beauty of side lamps is their sheer versatility and range of different styles and patterns. More traditional styles tend to incorporate a basic stem structure with material lampshade, though even these common additions tend to offer a broad range of different lampshade materials and patterns. 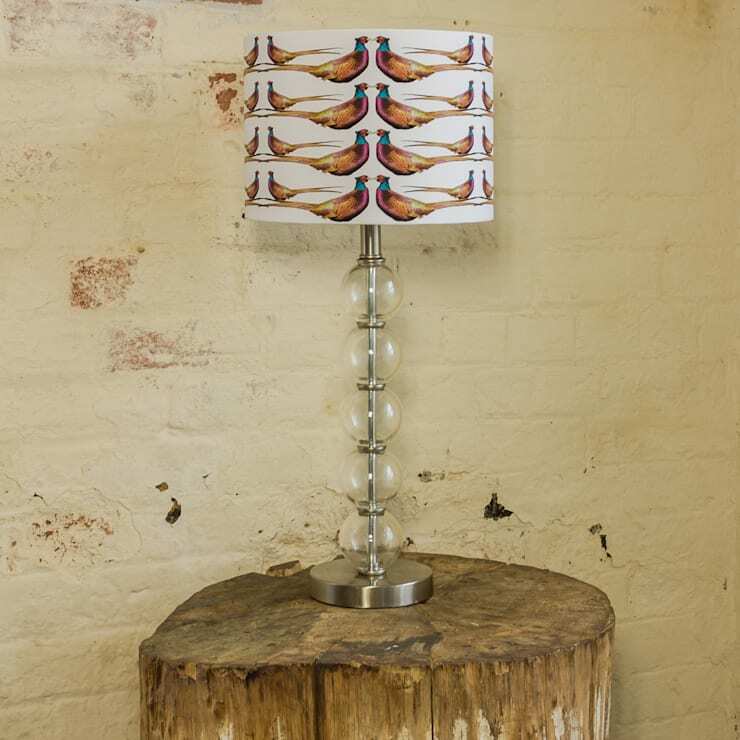 Here's a fabulous example of what's possible: a traditional side lamp design, with an ultra-unique glass bauble stem design, replete with unique bird-themed lampshade for a delightful, individual, and rather creative point of difference. While the humble side lamp can effortlessly provide a good dose of ambient illumination, sometimes you may require something with a little more aesthetic or perfunctory edge. Floor lamps are a great way to make a bold design statement with your living room lighting, as well as shed a unique array of light on the space. While a traditional floor lamp can be the way to go, you might consider making the most of your living room space by employing interesting and unique design alternatives to the more tried and true options. 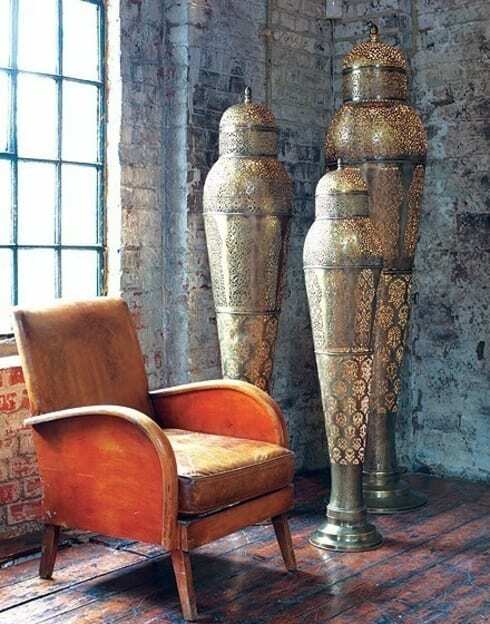 As we see in this vibrant, exotic example, not all floor lamps come in the same shapes, sizes and styles: to create a captivating and romantic point of difference, consider adding a feature piece or two like this superb ornate brass Middle Eastern inspired installation. 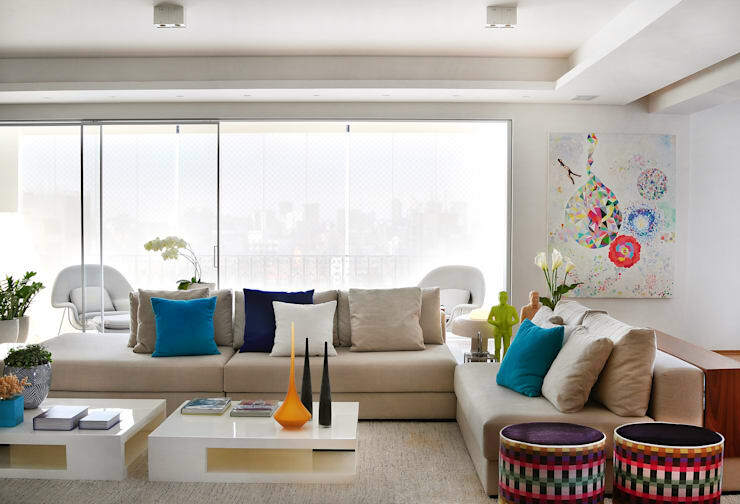 Of course, inducing a sense of fabulous ambience in the living room isn't all to do with artificial lighting: for a truly versatile and delightfully lavish sense of comfort right throughout the day, embrace natural light and let it shine into your living room setting as much the design of your home will allow. This example provides a perfect testament to the virtues of natural light: bright, vibrant, and effortlessly alluring. By all means, reign in the nighttime splendour with a neat array of artificial options, but make the most of the daytime too with maximum natural illumination. Sometimes, all you need to induce a sense of ambient goodness in your living space is through the inclusion of a well-selected feature piece. For centuries, the chandelier has been considered one of the more decadent additions to a domestic interior. However, these days, a fine, palatial chandelier is well within the realms of most modern homes, and can make for a beautiful addition to any living room. This gorgeous, traditional-styled glass chandelier is a truly stunning design statement, effortlessly dimmable for a more sultry setting, yet bright and bold as can be when needed. For a blend of ambience and old fashioned opulence, you can't go past a beautiful feature chandelier. Did you enjoy that Ideabook? Why not shed some more creative light and keep the ideas flowing with Home lighting designs you’ll love? Do you have any other handy lighting tips for our readers? We’d love to hear from you in the comments section below!